Are you enabling your email subscribers to spread your message via social media? Call it Forward to a Friend 2.0. Call it the inevitable marriage of two sides of the customer relationship coin. Call it the next big thing in email marketing. But the progressive wing of the email provider universe, led by Silverpop, have stopped worrying and are marrying email and social media together – with eye popping results. Why Should Your Good Email Offer Be Restricted to Subscribers? Silverpop’s Share to Social program enables all customers to insert links to major social media outposts (Twitter, Digg, Facebook, MySpace, et al). When email recipients click those links, it cues up a Tweet or status update with a link back to the email’s Web page version that has been customized to protect the recipient’s identity. Here’s a good example from Gymboree. Click here to see the email live, and to see the social media icons in action. When you click the Facebook icon in the Gymboree email, it pre-populates a customizable profile update reading “Happy New Year! 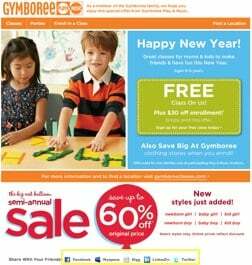 FREE Class At Gymboree Play & Music!” with a link to the email. 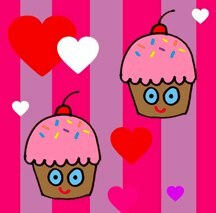 You can also select between two different accompanying graphics. Part of the problem with Forward to a Friend is that it was a lot of work for the forwarder. Typing in email addresses, writing introductory notes, etc. With this Share to Social system, Silverpop has made it easy for email subscribers to tell their ENTIRE social media network with one or two clicks. While the ability to tell others about something via social networks is nothing new (see the Share This icons at the bottom of this post), the ability to track the effectiveness of that marketing component is exceptionally interesting. Silverpop includes robust performance data with its Share to Social program, enabling customers to determine how virally successful particular emails or offers were. As Richard Evans, Silverpop’s Product Marketing Manager points out, even more intriguing is the ability to begin to segment your email list by influence. If a portion of your subscriber list often shares your emails on Facebook, and their networks then participate in the offer, do you begin to communicate to that portion of your list differently? If you’re a 1:1 proponent and a drinker of the Subscribers Rule KoolAid, you definitely do. According to Mr. Evans, Silverpop has sent more than 2,700 emails that have included the Share to Social links since rollout last Fall. Shared items have generated an additional 60,000 email opens and 21,000 email clicks from social network users. In one instance, a single recipient generated 4,550 clicks via social media from a single shared email. But, just because you CAN share emails via social media doesn’t mean your email subscribers will do so. The email needs to have a clear, compelling offer that can be communicated quickly and easily. Some of the brands that are experimenting with Share to Social aren’t combining it with a strong call to action, and I suspect their results will be less exciting. In fact, 73% of all emails that were shared via social media did not get opened by anyone else. The post-click experience varies widely due to the technical limitations of each social network. It’s great on Facebook, which has accounted for 60% of the social media opens so far. On Twitter, it just dumps the email URL into a Tweet. On LinkedIn, it sets up a potential news update, but doesn’t provide any text. Optimally, every social outpost would do as much of the redistributing work for you as possible, with canned text and graphics inserted. That may be a technical limitation at present, but if this system continues to take off, I foresee better cooperation and tighter integration. Are you ready to give Share to Social a try? Which other email service providers are offering similar options?